Our family is a GREAT lover of animals and my children absolutely LOVE the Kratt Brothers from shows such as Zoboomafoo, Kratt's Creatures, Be the Creature and Wild Kratts! We don't watch too much T.V in our house but we do let our children watch PBS Kids and the Wild Kratts shows have become a HUGE hit with us all. 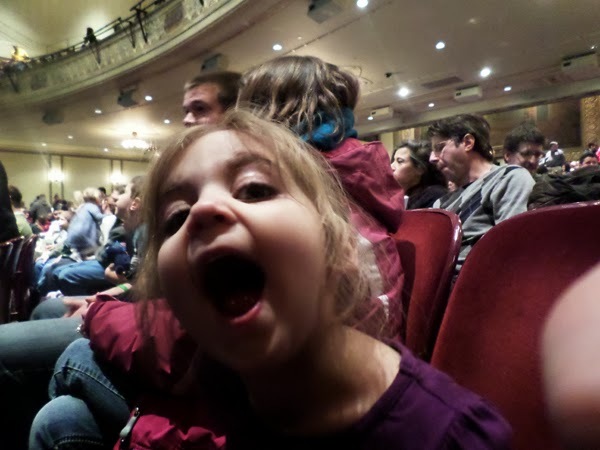 We were SO EXCITED to see that the Kratt Brothers, Chris and Martin, were headed to our neck of the woods this past week for a live performance and were over the moon when we were offered the chance to attend! 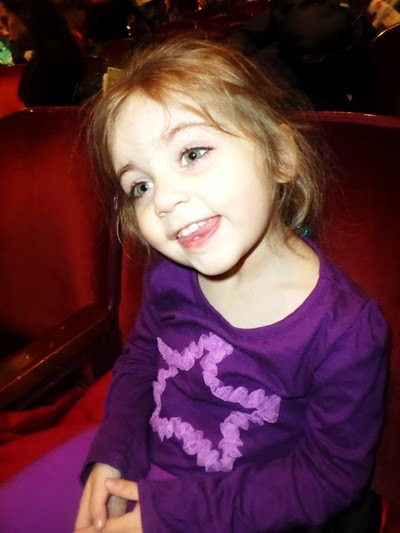 The venue was the Santander Performing Arts Center on 6th St. in Reading, PA. It was 10:45am and everybody who was anybody had flooded through the center in waves of very enthusiastic parents and children ready to see the 11am set. Parents had traveled with their young ones and adult fans of the show had traveled alone! One dad I spoke to had brought his kids over from Wisconsin [hundreds of miles away] and one lady had driven for several hours - on her own, on a whim - in case there were still tickets available after not being able to secure one online. 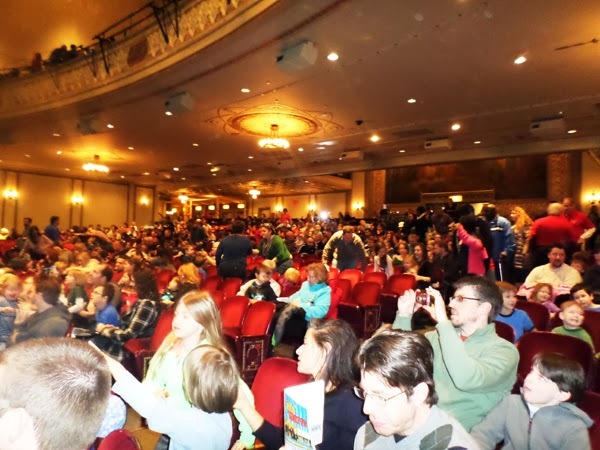 The Wild Kratts fans are passionate and they were certainly not holding back for this event in any way, shape or form and the atmosphere was electric! We made it to the orchestra section of the theater and found our seats quite close to the stage and, taking a look back, noticed just how much of a full house event this was and that every single one of those people had excitement in their bones! The Kratt brothers were welcomed on stage with loud cheers and roars from the children and they all listened intently as they were told the story of one of their first adventures and enjoyed Chris running through the audience and interaction with the crowd! It is safe to say that there was enough story, action and comedy to entertain parents and children alike, with ease. The amount of energy that both Martin and Chris have between them is just out of this world and they connected with the kids in the audience with a lot of back and forth. With children yelling at the top of their lungs (when requested) to emulate various animals through the narrative, they happily obliged and jumped around in turn when asked to do that, too. 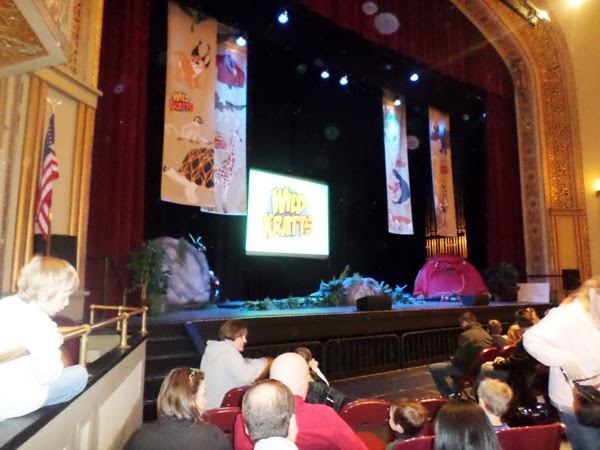 We got to see the Kratt brothers dress up in real-life power suits and interact with Aviva from the Wild Kratts show, via a large on-stage screen and a little imagination! I thought that they worked their animated selves into the show quite well and everything was so fast paced that you couldn't help but get yourselves involved. The show broke for an intermission mid-way and everybody headed out to the lobby to pick up some Wild Kratts merchandise, which seemed to be going down a storm! This was the first time the merchandise was available here and people were making the most of their trip to Reading! Some of the items available for purchase were cuddly animals, DVDs. figures and creature power suits/vests, to name a few! It was fun watching so many children running around in either their blue or green creature power vest just having so much of a great time! While nobody knows when Christ and Martin will make their way back to Reading, PA. again, they will surely be around the country in the future and if you would like to stay up to date with their travels [and to find out when they might pop up near you] then hop on over to their Facebook page and hit "Like" to stay informed! For more information on the Wild Kratts Animated T.V show [and subsequent merchandise] you can find them at their PBS Kids home/shop HERE! See you on the creature trail! Disclaimer: I was given 2 tickets to this event and all opinions from this particular event/performance are open, honest and my own through that experience without bias. Thank you! Looks like you had a lot of fun! Your daughter is beautiful! So glad your brode got to enojy their show. We also adore them. I have been folowwing thrm since mid 90's, and now my kids love them. We caught them in Ottawa and cant wait to see them again. Glad you had fun!! Sounds like you all had a great time. You're daughter is so cute! 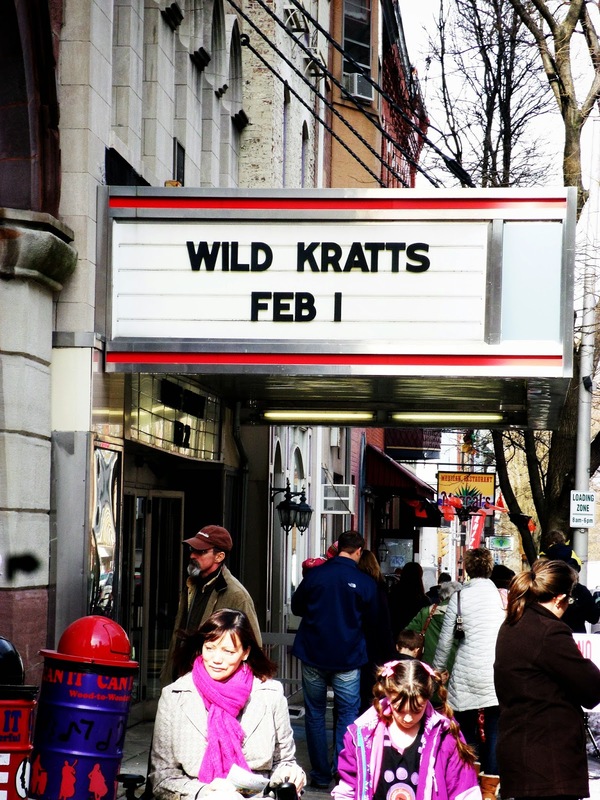 I have never heard of Wild Kratts but it sure looks like you had a fun time and will have to check them out. Yup, lots and lots of merch! All of it very affordable, too! Those little vests were so adorable but there was so much more! Oh my goodness! It looks like you guys had a blast! I have never heard of the Wild Kratts, but it looks like something my youngest would love. It looks like you had a great time! Just recently watched that show. Didnt hold grandsons attention YET but then he is only 8 months! lol I thought it was pretty cool show! We will try again when he is a bit older! Awesome! They are coming to my city January 2015. My daughter LOVES them so we will probably take her. How long would you say the show was overall?